School food service is a multibillion dollar industry that impacts the lives of over 30 million (mostly) low-income students. Every school day and, with increasing frequency, during summer weekdays as well, this industry provides two-thirds of students' meals (breakfast and lunch), as well as snacks, contributing a large portion of the nutrients youth consume throughout their childhoods. To qualify for a free school lunch, a family of three must make less than $26,208 in 2016-17. School food service directors have a huge charge on their hands: feed kids, every day, with a lot of requirements, for very little money. The current reimbursement rate for free meals provided to students in California is $3.31, which is required to include at least ½ cup of fruit or vegetables, and the choice to select a whole grain food, a protein food, and low-fat or non-fat milk. Elementary school kids from higher-income homes pay around $3 for the same meals. So, when a canned mandarin from China is more economical than a local pixie tangerine, how does this impact food service directors' decisions to make sustainable and healthy food selections? 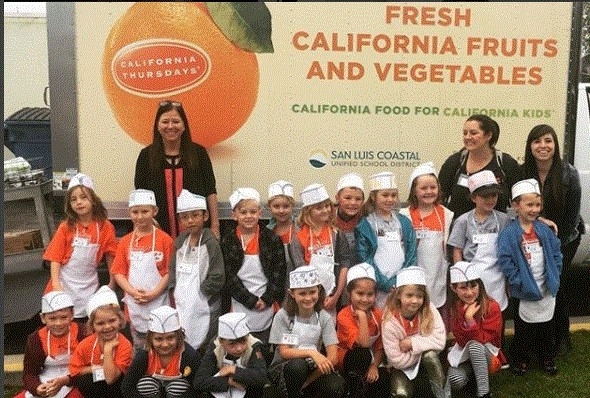 According to the San Luis Coastal Unified food service director, Erin Primer, food service directors have a lot of power to make healthy (or not so healthy) selections. Primer is a school food champion, who some have said is “murdering the lunch lady game.” Primer's first venture into institutional food service was in the private industry and catering. She learned how to get things done, how to be competitive and, ultimately, how to serve a lot of food that people want to eat. Primer credits this background with enabling her to see things more creatively. How do you feed kids healthy food while considering the broader impact of food purchasing decisions? Primer says it comes down to participation, it is a game of numbers. How many students and families will choose to eat a school meal on any given day? For Primer, that's about 3,000 lunches and 2,000 breakfasts every day - a number she would like to see grow. “We started with asking ourselves, does it taste good? Is it good quality? Is it sending the message we want to send? And if it's not, let's not do it, Primer said. One of the biggest changes Primer has made to her menus is first, getting rid of the junk. In the world of school food, you can find chocolate doughnuts and cinnamon-sugar cereals that meet USDA regulations for the school meal program. In many cases, food processing companies have reformulated popular food items specifically to meet requirements. By adding in whole grains, or reducing the sugar, fat or sodium content in a product, they can be sold at school even if you could never find that same version of the product in the store. When students see these products at school it can send them mixed messages about what should be included as a regular part of a healthy diet. The next change she made and continues to make includes increasing the purchase of local foods and removing items that can't be obtained locally. 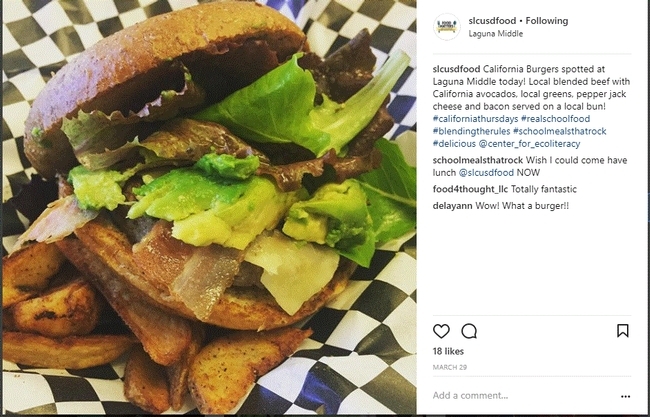 She is able to serve local, grass fed beef on the menu in a “blended burger” which includes mushrooms to make it larger, tastier and economically feasible. She also became one of the first school food service directors to use local grains by featuring emmer farro from a farmer that is less than 15 miles from her office. In addition, she has made some waves by replacing bananas on her menu with other local fruits, like kiwi. Living on the central coast of California, there is an abundance of local foods available most months of the year. However, “local” does not need to be barrier for food service directors. Defining what is “local” or “regional” is up to each district or institution, who should take into consideration the surrounding agricultural landscape, seasons, and what foods are reliably available. The last, but really important, step that Primer is working on is telling her story. Working with partners in creative ways, Primer is working hard to sell school food to all families in her district, regardless of their incomes. Her goal is to make meals that all kids want to eat and parents want to buy. She has her delivery trucks wrapped in pictures promoting the local foods they serve each day and she talks to local stakeholders, teachers, parents and school board members at every opportunity. What are we feeding our kids? Where did it come from? How do our purchasing decisions impact our world? These are the questions being tackled by school and institutional food service directors every day, whether they are aware of it or not. How they choose to answer those questions will have broad reaching impacts on our communities and future generations. A UC Cooperative Extension workshop series in Los Angeles will help city growers build their knowledge on legal, production, marketing and food safety issues. 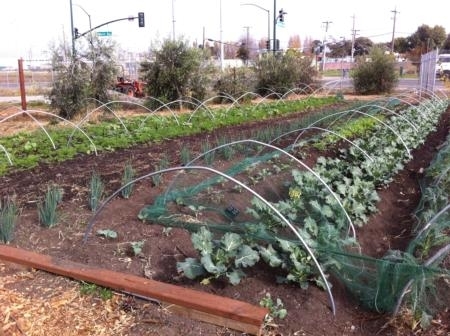 In communities around California, urban farms provide fresh produce, community green space, and even job training. 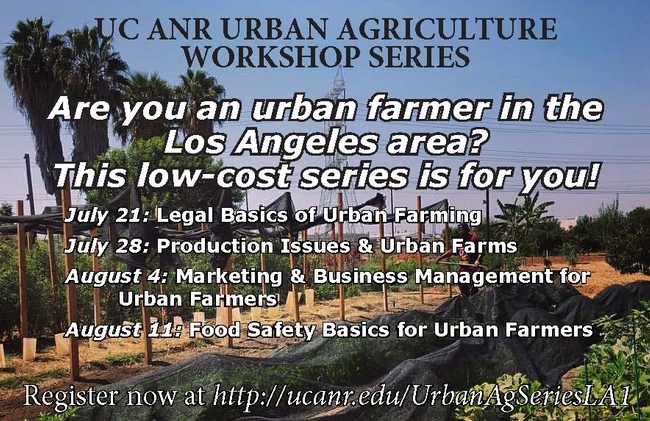 However, a 2014 UC ANR needs assessment indicated that urban farmers face challenges, as well as opportunities. They are often beginning farmers, and encounter barriers related to growing in the city, such as zoning restrictions. July 21. Legal Basics of Urban Farming. Are you an urban farmer navigating the rules and regulations related to growing and selling food? A school or non-profit organization involved in farming? This workshop will help position you for success. July 28. Production Issues and Urban Farms. Are you an urban farmer learning the ins and outs of growing and harvesting crops? This workshop is designed to guide urban farmers through common production challenges related to soil, water use, and pest management. August 4. Marketing and Business Management for Urban Farmers. From business planning to labor laws, learn the basics to help you succeed. August 11. Food Safety Basics for Urban Farmers. Learn how to ensure a safe harvest, from the field to the fork. Local partners are key to planning and hosting these events, including the Los Angeles Food Policy Council, the Collaborative for Urban Agroecology Los Angeles, Cal Poly Pomona College of Agriculture, Community Services Unlimited, GrowGood, the Growing Experience, and others. The series will also be held in Sacramento and San Diego in early 2018. 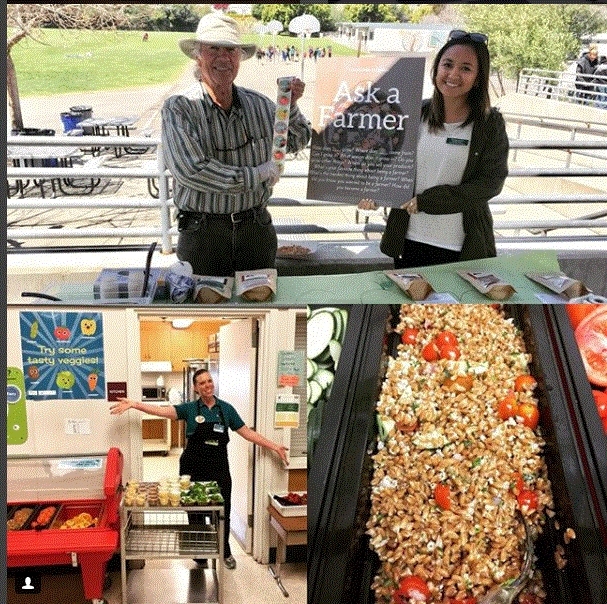 For updates and announcements, follow UC ANR's Urban Agriculture blog, Facebook, and Twitter. And be sure to bookmark our UC Urban Agriculture website which offers resources on production, policies, and more. Man picking in San Luis Obispo County orchard. A close look at a county's food system is a powerful way to understand the county's health and prosperity. The food system incorporates every county resident - from farmers who grow food, to truckers who transport it, food workers who prepare it, and everyone who buys, eats and disposes of food. 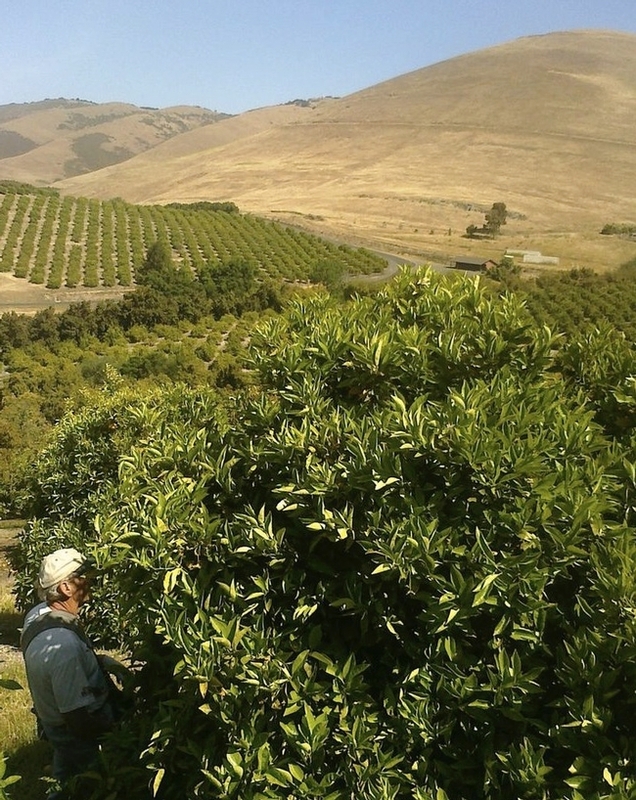 A new report assessing San Luis Obispo County's food system links the vitality of the county's agriculture with the health of its residents and its food businesses. 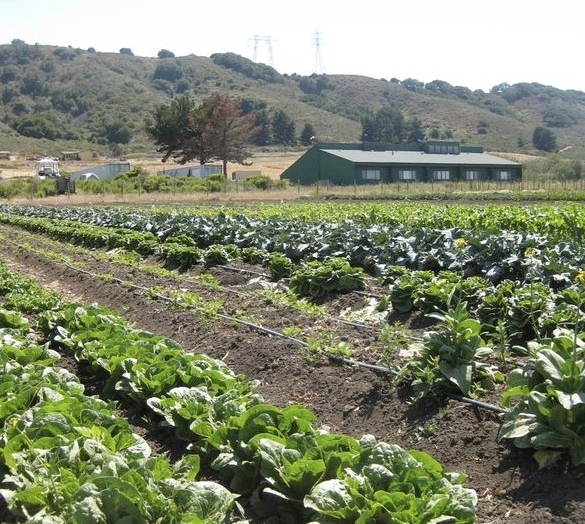 Conducted by the UC Sustainable Agriculture Research and Education Program (UC SAREP) and Central Coast Grown (CCG), the San Luis Obispo County Food System Assessment examines the relationships between agriculture, regional environmental quality, human health and local livelihoods. In 2007, farmers in San Luis Obispo County sold agricultural products valued at $4.3 million directly to consumers, an increase from previous years. The report suggests that continued promotion of local and direct marketing of food can assist all producers, including new farmers, in entering the marketplace and bolstering the local food system overall. Those markets will be especially important as the number of farmers in the county grows. In 2007, there were 850 more agricultural producers than 10 years prior. But the majority of farms in 2007 reported gross sales of under $250,000 per year, with nearly half of all farms in the county reporting less than $5,000 in annual sales. San Luis Obispo County farmscape. One potential way to increase that participation is to identify food processing and distribution capacity in the county and find ways to expand them, the report recommends. In a parallel survey conducted by Central Coast Grown, they asked farmers and restaurant owners about the challenges to selling and buying locally. The report also addresses access to healthy food as a component of the county's food system. Participation in food assistance programs like CalFresh and food distributed by food banks in San Luis Obispo County have both increased over the last decade, though overall food insecurity in the county has improved marginally. While increases in food distribution may mean those outlets are accessing more people, it also means more people are in need of the assistance. Beyond continued support from government food programs, the report recommends ways that increasing food access for the public and improving markets for local producers can reinforce one another. 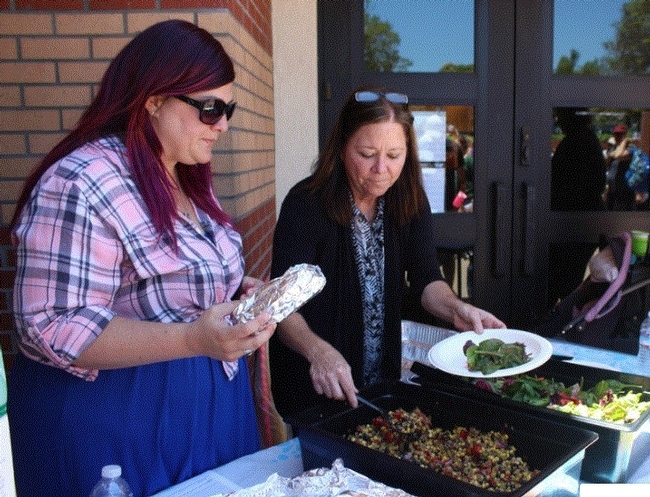 Food-focused community development strategies such as mobile markets, community farms, and farm-to-school bring agriculture into neighborhoods and schools and help close the gap between producers and consumers. 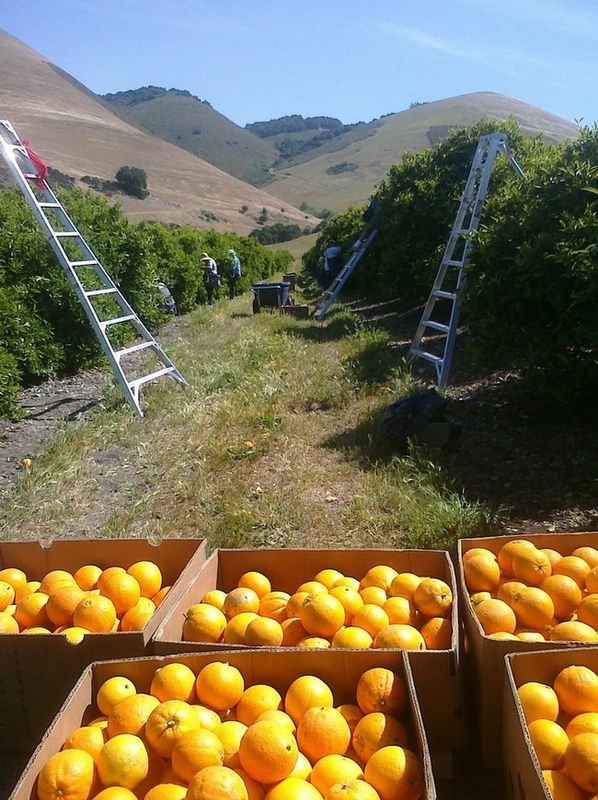 San Luis Obispo County oranges. San Luis Obispo County also faces water quality and water quantity challenges that are echoed throughout the state. Nitrate contamination from both urban and agricultural sources affects local lakes, rivers and streams. Groundwater and coastal stream resources both present significant challenges for agriculture and rural communities dependent on them for drinking water. “Accounting for those concerns within the context of the entire food system may bring a broader scope to the discussion along with the potential to leverage the efforts of the many groups already working on water resources issues,” Bianchi said. The Food System Assessment was conducted in partnership with the San Luis Obispo County Food System Coalition. Coalition meetings are held quarterly to discuss local food system issues and are open to the community. The report was funded by the California Department of Food and Agriculture which also supports Central Coast Grown's upcoming release of a Public Land Survey that identifies underutilized agriculturally viable land county-wide. The report is available on the UC SAREP and Central Coast Grown websites.